Antoine “Fats” Domino, the rhythm-and-blues singer whose two-fisted boogie-woogie piano and nonchalant vocals made him one of the biggest stars of the early rock ’n’ roll era, stopped touring in the early 1980s when he decided that he did not want to leave New Orleans; he said it was the only place where he liked the food. He was often seen around New Orleans, emerging from his pink-roofed mansion driving a pink Cadillac. “I just drink my little beers, do some cookin’, anything I feel like,” he said in 2007. 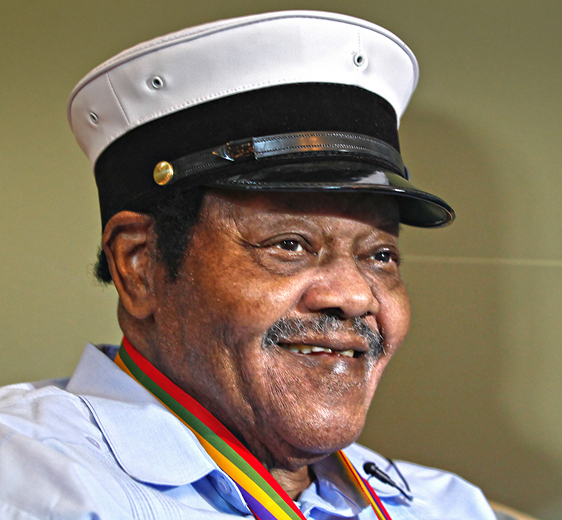 This according to “Fats Domino, early rock ’n’ roller with a boogie-woogie piano, is dead at 89” by Jon Pareles and William Grimes (The New York times 26 October 2017). Today would have been Domino’s 90th birthday! Above, in 2013; below, performing in 1955.